I'm trying out a couple of new ideas for the blog as a means of developing it further, and one of those is empties posts. I've done a couple of reviews of beauty products that weren't nail polish (as hard as that is to believe!) but it's something I wanted to do more of. Having seen empties posts and videos on a few other blogs, particularly over at lilmisschickas, I thought this would be a good thing for me to do so I wouldn't forget what products I've tried and whether or not I liked them. I've also started working on using up all my old beauty products, as part of a means of saving money whilst I'm still job-hunting, and starting a series of empties posts seemed like the best way to tackle both of those! The first post for this column is going to be Lush's Creamed Almond and Coconut Smoothie, for the simple reason that it was the one I most recently used up. It does also have some sentimental value for me as it was one of the first products I ever bought when I was first introduced to Lush. I never shopped there much when I was younger - the product of growing up in rural Lancashire - but when a schoolfriend moved to Leeds and couldn't stop singing its praises I had to try it. Admittedly in recent years I've fallen out of love with it, due to over-elaborate stunts and discounting a lot of products I loved (I'm still in mourning for Tramp shower gel and 25:43 perfume), but when they got it right in those early days, they got it so right. Creamed Almond and Coconut Smoothie is pretty much what it says on the tin - think of it like putting soap into a blender and mixed with natural oils to create a very thick liquid. The first thing I have to say is it smells absolutely amazing. As well as the almond and coconut, it also contains vanilla pod and ylang ylang, creating the most beautiful rich, sweet smell that's really unusual too - I'm still sniffing the pot for those last lingering traces of the scent. It's also fantastically moisturising. As someone who's suffered from dry skin patches since I was little having a product like this, packed with lovely ingredients that feed your skin, is brilliant, especially in the winter. The fact that I don't have to use a body lotion with it is testament to the fact that this stuff works (although I would have loved a body lotion or a perfume of this scent), and I am absolutely bereft that it's gone. Have you tried this product? What did you think of it? Does it sound like something you'd use? 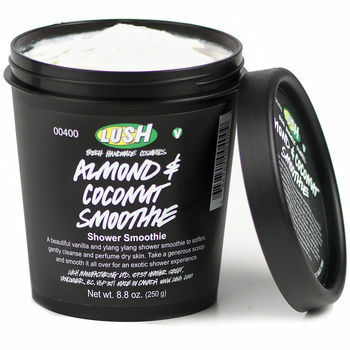 What other Lush products do you love? And please let me know what you think of this as a new feature, I'm always keen to get feedback!